I’m calling this Apple Cranberry Heirloom Cake because I fondly remember my grandmother making this, but have recently learned that the origins of the cake are a bit fuzzy. On a trip to New York last month we enjoyed an afternoon visit with my Aunt (my grandmother’s sister). 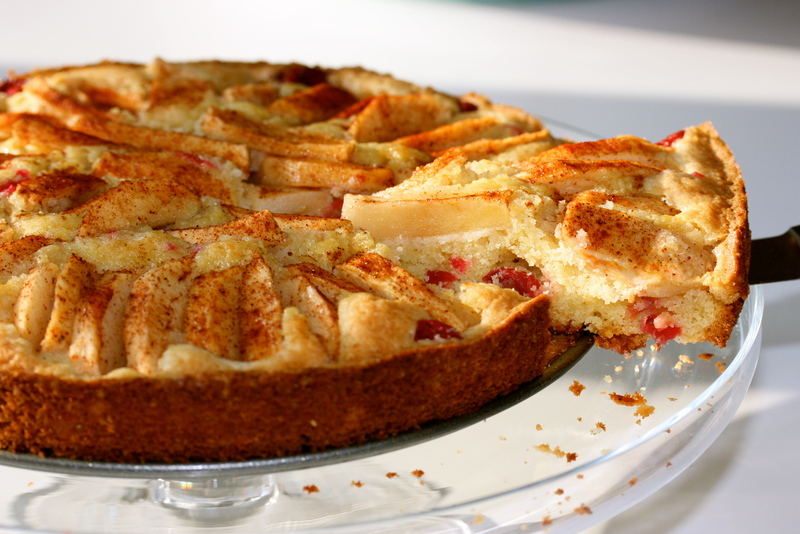 She baked this cake using small Italian plums and indicated that it was her plum cake recipe. As soon as I saw the cake I realized this was the same cake that my grandmother used to make when I was growing up. She also referred to it as her plum cake recipe. 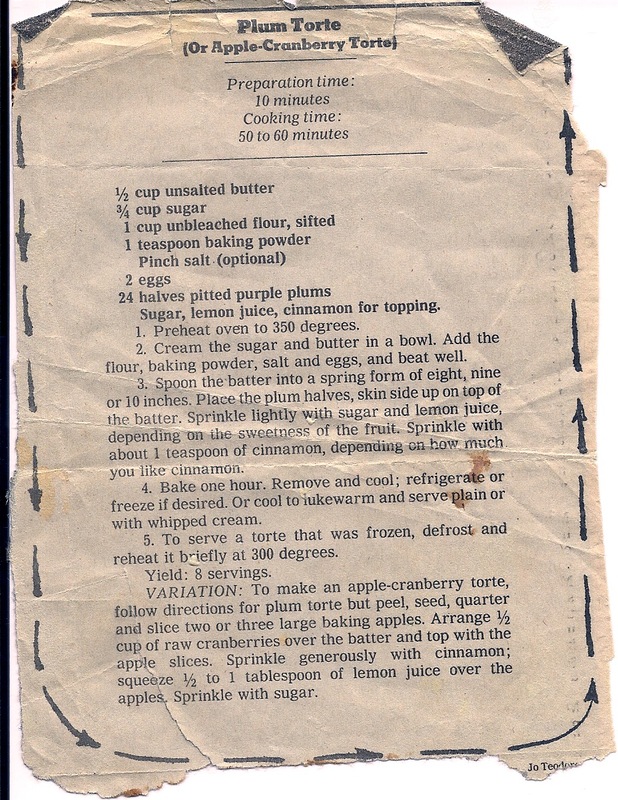 In fact, I have the recipe on a pretty card from my grandmother, pictured below. I have since learned that the recipe belongs to the New York Times, originally published in the early 1980’s. Whose cake is it? Served with ice cream or whipped cream for dessert, or even for breakfast with a cup of coffee, this one’s a keeper. I have made this with apples and cranberries here or you can use plums as called for in the original recipe. 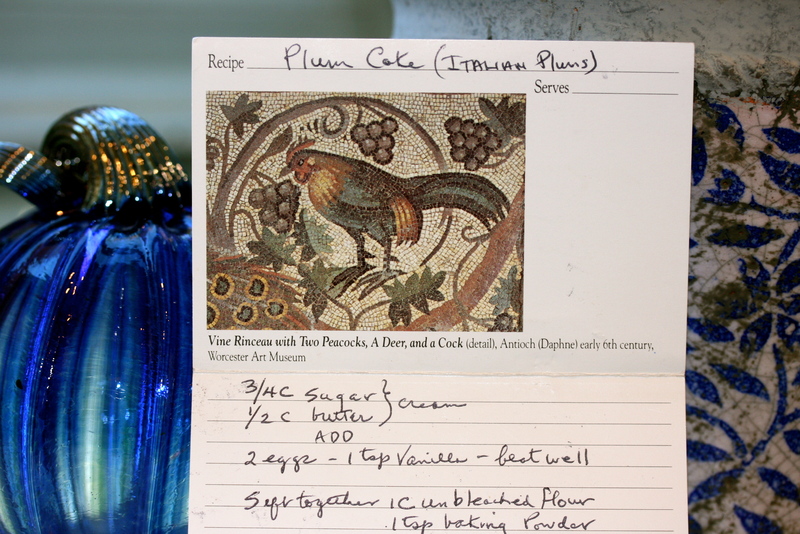 Italian plums have a short season so they aren’t always available, hence my version here. Preheat the oven to 350 degrees and grease an 8″ springform pan. If you are using plums, cut each in half lengthwise and remove the pit. If using apples – peel, core and slice. Place the fruit in a bowl and sprinkle with a little sugar and cinnamon and a spritz of fresh lemon juice. Toss together and set aside. In a mixer, cream together the butter and sugar. Add the eggs and vanilla, beat well. In a separate bowl, combine the flour, baking powder and salt. Grandma’s recipe card says to sift them together – I didn’t and it was perfect. Feel free to sift if you prefer. Add the dry ingredients to the mixer with the wet ingredients. Don’t overmix. The batter will be dense. Pour the batter into the prepared pan and smooth the top. 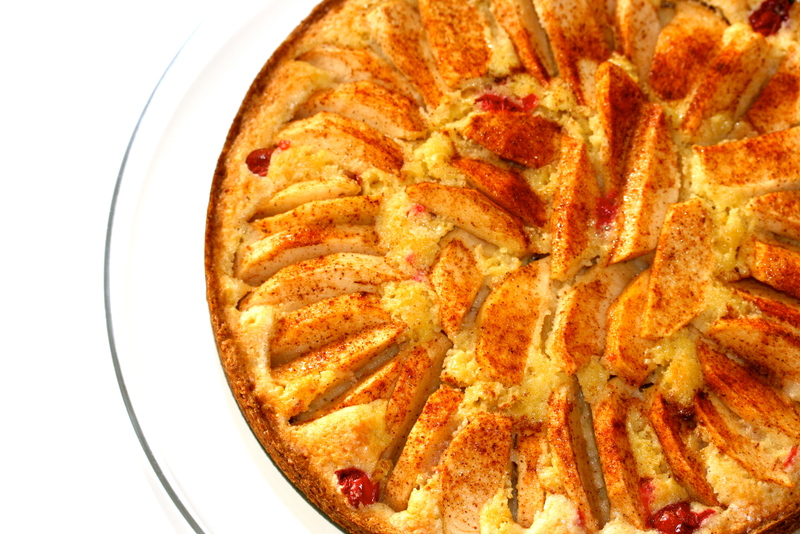 Sprinkle the cranberries over the batter and lay the apple slices in a pretty pattern over the top. If using plums, place the halves skin side up, close together. They look pretty if you make a circular pattern all over the cake. Sprinkle the top of the cake lightly with a little extra cinnamon and sugar and bake for one hour, checking at 50 minutes. Cake is done when toothpick comes out clean. * I did a little research online for the original recipe. Looks like many people have made versions of this referring to the New York Times as well. I can’t take away my Grandmother’s ownership of this one… for me, it will always be a Grandma Ruth original. But here’s the original from the New York Times compliments of my other favorite Aunt. Can’t believe she found this after all these years. Obviously the cake’s origin was no mystery to her. Lovely post. The beauty of cooking and recipes is in how they evolve with each person adding a bit of their own personality. Many thanks! I love this cake and it certainly has a history in my family… makes it much more fun creating a post.